I clipped this recipe from the Detroit Free Press just a couple of weeks ago. The Freep adapted it from Food: Vegetarian Home Cooking by Mary McCarney. I don’t usually rerun recipes so quickly. To tell the truth I don’t even usually try them so quickly! But I liked this one so much I wanted to share it with you. It’s a bit of a bother to make, but it would be a great dish to serve to vegetarian guests because it looks so fancy. Eggplant is nice and meaty, so this dish should appeal to carnivores too. Each wrap has only 95 calories, 7 grams of fat, 5 grams of carbs, 4 grams of protein and 3 grams of fiber. You can assemble the wraps ahead of time and heat them up just before serving. Half the original recipe (the amounts I give below) made eight wraps, so we had them for two meals, and they reheated nicely. The Free Press suggests using a serrated knife to cut the eggplant. I will give you the recipe almost as it was in the Freep, except that I’ve halved the amounts — except for the oil. I found I needed at least as much oil as originally called for even though I was making half the recipe. But I’ll also tell you the changes I made and provide a few other suggestions for variations. I didn’t have any marinated sun-dried tomatoes, only dried ones, so about a half-hour before I started cooking, I covered the dried tomatoes with olive oil to marinate. After I took the tomatoes out, I used the oil (with some added) for the recipe. For the mixed herbs, I used minced garlic, basil and parsley. I didn’t have fresh spinach, but my garden was producing lots of chard and kale, so I used a mixture of those. Most importantly, after I had fried the eggplant slices, some were not really flexible enough to bend into wraps (perhaps I sliced the eggplant a little too thickly?). So I popped them into the microwave in a single layer for 30 seconds and they became perfectly pliable. Use thinly sliced or diced fresh tomato instead of sun-dried. Drain as much juice from them as you can before adding to the wraps. Use goat cheese or feta instead of cheddar. Use slivered almonds instead of pine nuts. Preheat the oven to 350 degrees. Coat a sided baking sheet with olive oil spray or use a nonstick baking sheet. In a small bowl, mix together the herbs and oil. Heat a large frying pan over medium-high heat. Working in batches, lightly brush each slice of eggplant on one side with the oil mixture and place in the hot pan. Fry until golden brown on one side, about 3 minutes. Brush the top side lightly with oil and flip to fry that side, another 2 to 3 minutes. Set aside the slices until all are cooked. Wash the spinach well in cold running water, spin dry and then heat in a large skillet to wilt, using just the water that is clinging to the leaves. Drain off the excess liquid. 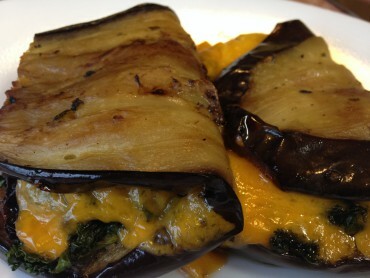 Assemble the wraps: Take one slice of cooked eggplant and place a little of the wilted spinach on one half. Then place a few pieces of sun-dried tomato on top, sprinkle with a few toasted pine nuts, and top with a slice of cheddar. Fold the eggplant over to form the wrap and place on the baking sheet. Repeat with the remaining eggplant slices. Sprinkle each with sea salt and fresh black pepper. Bake for 15 minutes until the cheese has melted and is bubbling. Serve immediately. 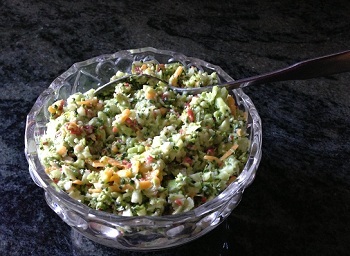 I first encountered this salad at a potluck. Everyone was raving about it, but I didn’t eat it because it included bacon. But I looked for a recipe online, figuring I could substitute soy baco bits. I found this one on a site called BellaOnline and altered it a bit. The original recipe calls for 4 slices of bacon, which we obviously don’t use in a kosher kitchen. It also called for mozzarella cheese, which I found rather tasteless, so I substituted cheddar. And I use about half the amount of dressing called for in the original, which is plenty (my quantities are what I list here). If you’re concerned about the sugar, you can substitute Splenda, which I have done with no ill effect on the taste. Finely chop the broccoli, onion and hard-boiled egg. 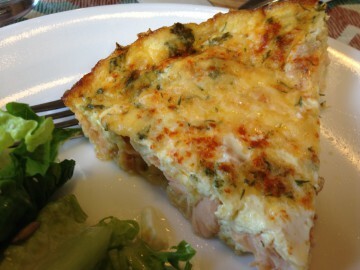 If you use a food processor for this (a good idea), do the vegetables first and add the egg at the end for a few pulses. Mix in the cheese and “bacon” bits.